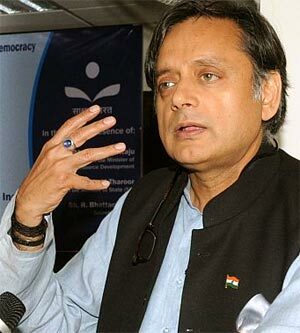 Bowing to pressure from Youth Congress activists for its statements against Union Minister Shashi Tharoor over the Duleep Trophy final in Kochi, the Kerala Cricket Association tendered an apology to him for "hurting his sentiments". The move came after agitated Youth Congress workers barged into its office on Monday and forced them to give a written apology for their statement against Tharoor, who had criticised KCA after rain washed out the fourth day's play of the Duleep Trophy final between North Zone and South Zone. The activists also broke a clock in the premises, KCA sources said. KCA joint secretary Jayesh George said that he gave an apology in writing stating that "we are sorry for hurting the sentiments of the minister". Tharoor had on Sunday hit out at the KCA after the fourth day's play was called off due to wet ground conditions following heavy rain. "KCA has brought disgrace to d state w/two major matches washed out. Who benefitted from the Rs. 8 crore spent on drainage system," the Minister had said in his tweet. "KCA annual reports list JNI Stadium upgradation expenditure in crores. Since pavilion was already done, wasn't drainage the main expense? "Cricket fans await explanations of what KCA spent on stadium upgradation & drainage. Rains haven't prevented matches on sunny days before," he wrote. KCA president T C Mathew had responded saying Tharoor's tweet was "immature" and made without understanding facts. "Those who wish that KCA should not have a stadium of its own are trying to create a controversy. We have not taken any amount from the Government for drainage work," he said. "The Jawaharlal Nehru International Stadium was not for cricket alone but for football matches also," he added. North Zone and South were forced to share the Duleep Trophy after the fifth day's play was also washed out. Only 10 overs were possible in the five days with South scoring 33 for two.